The PTO will be available for spring flower pickup on Thursday, April 25 from noon until 6 beside the bus garage. The Minford Local School District will hold a registration day for the 2019 - 2020 school year for students entering grades Preschool through 8th. The registration process will take place in the ES/MS Guidance offices on Wednesday, May 29, 2019. Contact the elementary guidance office at 740-820-2225 with any questions or concerns. Congratulations to Kat Ball for setting a new school record in the 6 lbs shot put with a throw of 34 feet, 2.5 inches! 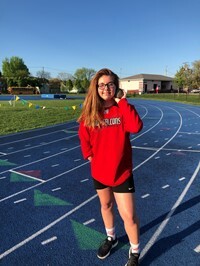 Kat set the new record at the Portsmouth Junior High Track Meet on April 22, 2019. The Alumni Banquet will be held on Saturday, May 25, 2019. The social hour will begin at 5 p.m. with dinner to follow at 6 p.m.
Tickets are by reservation only. The ticket price is $20. Tickets will be sale until May 17, and may be purchased from any committee member, or at the Minford Pharmacy. The annual fundraiser to benefit children at St. Jude's Hospital has begun. Donations will be accepted until May 3. You may send your donation to Mrs. Ramey's Second Grade room.